Read about this in the current edition of Auto Express. It came 2nd out of 12 contenders (to a cloth costing £8.68) and was miles in front of the Autoglym equivalent. The Poundland cloth absorbed 7 times its dry weight which is outstanding good. Bought one today and its worth every penny! I think it's a single cloth. yeah they do a few of them. The single one is much better than the multi pack (different weave pattern). In my local store they're in different parts of the store so you may have to hunt around! The big ones are very good for drying the car. I have a couple. The smaller ones in the packs of 3 are very good for cleaning specs and I've also used one of them for removing grout when tiling. It seemed much better for cleaning the grout from tiles than anything else I could find. They are branded "Driver" or Driver ......... something. They are much larger and very good, I got 3 light blue ones 6 months ago, in the car bits section. I read the review also. Strangely in the Mag it came 2nd but was rated further down the list on their web review. Here it is. Probably the difference between the single larger Black cloth and the small coloured multi-pack ones. Both priced at £1. Hot deal.I read the review also. Strangely in the Mag it came 2nd but was … Hot deal.I read the review also. Strangely in the Mag it came 2nd but was rated further down the list on their web review. Here it is.http://www.autoexpress.co.uk/products/products/251959/microfibre_cloths_tested.htmlProbably the difference between the single larger Black cloth and the small coloured multi-pack ones. Both priced at £1. The one in the link was an earlier review, the one in this weeks magazine reviewed the black one. 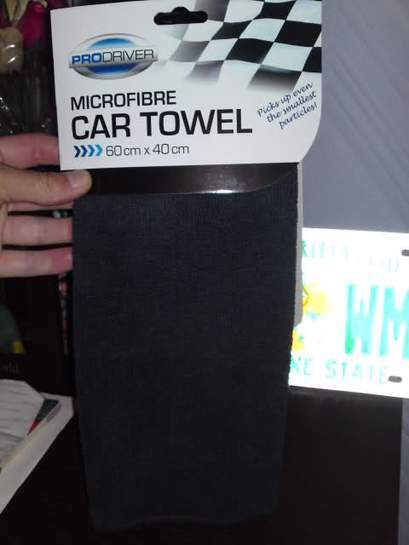 I bought 2 today, they were in the motoring section and are actually called "Microfibre Car Towel" 60cmx40cm. The 4 small coloured ones and single larger coloured ones (also 60cmx40cm) were in the cleaning section of the shop. I don't have a clue what the difference between them is apart from the colour. I find the ones on 6 for £2 offer at ASDA pretty good. I use them on my car, glasses and plasma - all things I take great care of. They're not massive but I find them the perfect size for cleaning the car. These might be even finer and therefore even better quality, but I've not left any marks on my car or glasses with the ASDA ones. Superdrug also have a box of 4 smaller ones for £1. I didn't read the AE review, but generally the higher a polydamide fibre count in a cloth [usually around 30%] the more liquid it will absorb. I wouldn't trust everything Auto Express claim to be the best in tests. I bought 2 items that came top of their reviews and they were both shi*e.
so has anyone put it to the test? Also can we have a photo of the cloth in op please, in my local they have black colour and very thin cloth. so has anyone put it to the test? Also can we have a photo of the cloth … so has anyone put it to the test? Also can we have a photo of the cloth in op please, in my local they have black colour and very thin cloth. Us 'Anoraks' do this! just a test to see if it scratches a CD that's all before proper use!